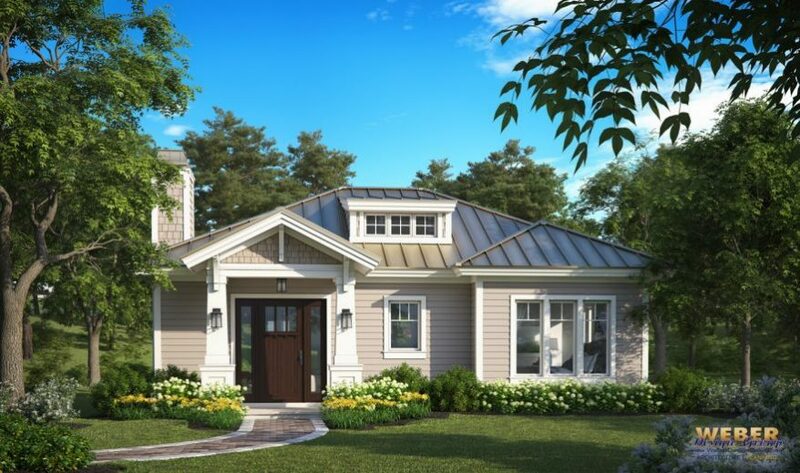 The Sweetwater Creek is a quaint cottage house plan with a great room layout that provides an efficient yet comfortable use of space. The one story floor plan features an island kitchen that flows into the spacious great room with a fireplace offering a cozy gathering space for the homeowner and a few guests. Ample natural light spills into this home plan through nice-sized windows and a dormer that accentuates the open feel of the home. 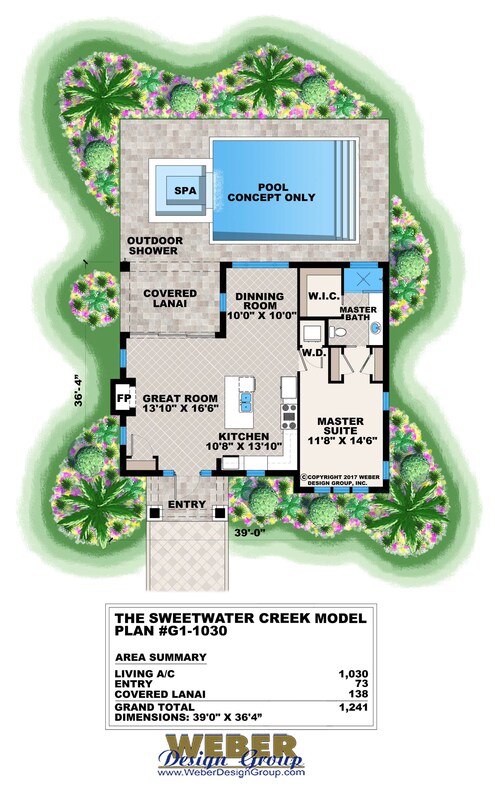 Even for a small house plan, the Sweetwater Creek capitalizes on indoor-outdoor living through a set of stacking sliders that lead to a covered lanai with outdoor shower. The master suite offers the convenience of a stack-able washer and dryer and several closets including a large walk-in for plenty of storage. Weber Design Group, Inc. hereby reserves its common law copyright and all other property rights in these plans, ideas, and designs. These plans and designs are not to be reproduced, copied, or changed in any form or manner. These plans and designs are not to be assigned to any third party without first obtaining the express written permission of Weber Design Group, Inc.
Weber Design Group, Inc. makes no claims or determinations as to the availability and or usability of this plan on any specific property or building lot. Building lot and property information must be verified with regards to the use of any plan. Verification of legal building limitations (i.e. property setbacks, height restrictions, building footprint limitations, etc.) is the sole responsibility of the owner, and not the responsibility of Weber Design Group, Inc. All plans are copyrighted by Weber Design Group, Inc. and the use of said plans on any property will require a license agreement provided by Weber Design Group, Inc. to avoid any copyright infringement litigation of Weber owned designs. Weber Design Group, Inc. reserves the right to limit or refuse a license agreement to build any Weber plan, on any property, at Weber's sole discretion. The information contained on this page is for the convenience of reference. It should not be relied upon as express or implied representation of the final detail of the construction drawings. The dimensions, square footages, and other details are approximate and may vary with the actual construction drawings.